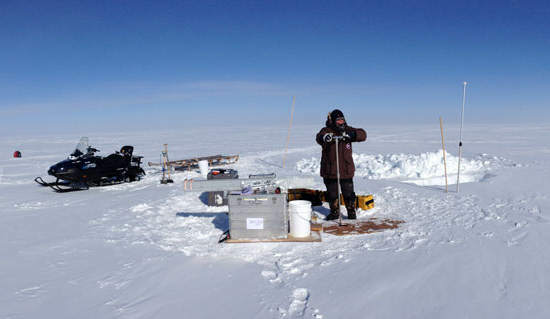 The ice is drilled in Greenland and Antarctica and is transported back home to the laboratory where it is prepared and made ready the measurements. Acid in the atmosphere can come from large volcanic eruptions and human-made emissions from industry. You can measure acidity in the ice by simply passing an instrument that can measure conductivity over the ice core. If there is a high level of acidity, the measurement turns out and it works great for measuring the climate of the past all the way back to the last interglacial period 125,000 years ago. But if you want to measure atmospheric acidity for the last 100 years, it is more difficult as the annual layers are located in the uppermost 60 metres and there the ice is more porous as it has not yet been compressed into hard ice. “We can see that the acid pollution in the atmosphere from industry has fallen dramatically since humanmade acid pollution took off in the 1930s and peaked in the 1960s and 70s. In the 1970s, both Europe and the United States adopted the ‘The clean air act amendments’, which required filters in factories, thus reducing acid emissions and this is what we can now see the results of. The pollution of acid in the atmosphere is now almost down to the level it was before the pollution really took off in the 1930s, explains Helle Astrid Kjær. Story Source: University of Copenhagen.